I find this cartoon offensive! But then again it’s just a cartoon. Maybe I should get over it. If only…. I could find a way to use it for my own political gain… Hmmmm. this reminds me of an early Opus Bloom County – Opus is at the bus stop and various people show up and say what people offend them – until finally they all scream “Life is Offensive” and run away. Wow, a side view of Mo! Should I be offended? Mohammad must have been ugly that he prohibited to get sketched or painted. Well who is “she” anyways. I assumed it was the barmaid but doesn’t say…. 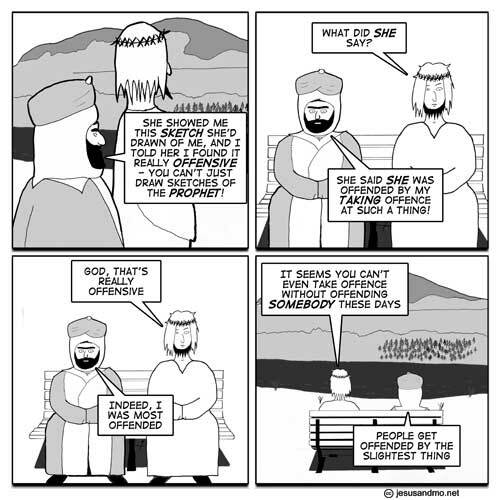 The Jesus and Mo stuff is totally puerile, like a child walking through mud puddles just to see the dirt on his boots. I can’t even summon up the interest to be indignant. @ben viccari and yet you could summon up the interest to comment on how puerile the ‘Jesus and Mo stuff’ is. If you think it is so childish, then why are you bothering to read or even comment. Doesn’t that take away from your precious grown up day and the energy you could be spending on something more mature? perhaps “she” is another diety; hence “God” would be a correct moniker…. @ben viccari. Joy to you! “Verily I say unto you, Except ye be converted, and become as little children, ye shall not enter into the kingdom of heaven.” as our good Lord said. Hang about and have a laugh. No need to abandon the unfaithful. Love it. Thanks for the humour. A mature religion should be laughing at it’s own ridiculous elements. @ben viccari: The puerility of your comment offends me greatly. If they did that, every church, temple or mosque would sound like clown school. I am offended that I didn’t get to this sooner, so my comment could be up higher. Might “she” be the author – or a he cleverly disguised as a “she”. In either case I am offended just for the hell of it. Tsss…of course ‘she’ is the barmaid! Who else would she be? Actually, I found the image of a child splashing through puddles just to see mud on his boots quite charming. Sounds like fun to me. It’s a pity that a brain capable of that kind of imagery has no sense of humour or joy in living. Meh. I’m not really offended at all. In fact, I’m feeling quite complacent! Except for YOU! YES, YOU! YOU I do NOT like – you offend me! Get out of my sight! I note that “offend” breaks down into “off” and “end”, also “of” and “fend”. What do you think He meant by that? Gematrically or numerolinguistacally speaking. I always get a laugh about people replying to a Fire’n’Forget troll. You should all save your indignation for more worthy things. People often troll when they’re drunk and lonely with only a warm screen for company, and by the next day they have forgotten where they went. You all might expertly, with wit and insight, deconstruct the postulated premise, but it’s wasted energy! Unless . . . you’re either trying to gain peer acceptance and show to everyone else how “right on” you are by refuting their claims, or acting with misplaced chivalry defending Author’s honour (I get the feeling that if he couldn’t take care of himself he wouldn’t keep this strip going), or simply reacting with vitriol that someone dares to challenge your own opinion. Just ignore them, trolls are a statistical inevitability that can be treated very effectively by massive doses of indifference. Plus, I always thought of ‘offence’ as meaning ‘getting off the fence’. Not literally of course, I went to school in England. I’m offended by their disrespect shown to ‘she’, through not using her name, as though there’s only one ‘she’ in the world. …I like to think the barmaid is probably God. Mo is allegedly not the prophet but only a body double (see the very first cartoon dated 24th of November 2005). If SHE drawed a sketch of the body double, SHE did not draw a sketch of the prophet. So, no offence. @simon, who seems to take offence that people respond to trolls and is himself doing so indirectly by responding to people who so respond, you have my deepest sympathy, my dear fellow, inasmuch as an mere innocent bystander is able to manifest sympathy. I must apologise for having myself so responded, even if I was merely inviting the troll to stay a while at our party. My favorite deffiniton of offense? @simon, I take offense that you would presume to deny me the pleasure of reading the responses to the drive-by trolls. I however am overjoyed that your post caused others to respond with wit. I therefore magnanimously choose to forgive your offense. Troll troll troll your boat gently down the stream, merrily merrily merrily merrily Jesus (and Mo) rules! Um, I was trolling, you je’mo’fos, just being a bit meta. Here, have some coffee. I too am offended, but I don’t know why? I am offended that no-one has offended me. Religionauts: Their existence and activity doth greatly offend me! Is it just me, or is Jesus putting on the pounds? @Don Yeah, can’t someone get this done. Apparently not. @Moh Memad: The Big Mo-bowski was depicted freely for… decades? centuries? (don’t care!) until it was decided later that he was too awesome sauce to be represented pictorially. 2 out of 3 Muslim sects agree to this stance. If you do an art history search of TBM, you will see more portraits and mosaics and illuminations of Mo than you can shake a stick at, some of which are of now-damaged artwork, but others which *gasp* show his face. Not sure where the intact originals are: I know on my trip to the Alhambra in Granada ES, all the mosaic murals in the mosques I visited had the head/face of TBM obliterated– somehow in god-slave logic this is more respectful than not smashing his face in. This is prescient and so appropriate right now! Also v funny – keep it up, we’re all with you! So you are saying the religions are like mud puddles? !